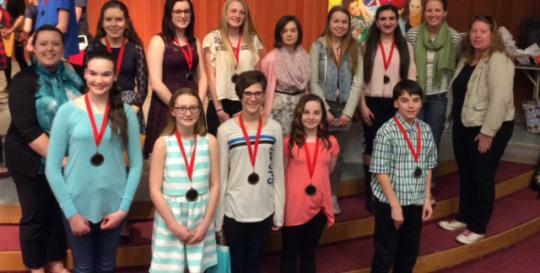 Congratulations is extended to the 37 CCRSB French programs students who recently attended the Provincial Concours at Mount Saint Vincent University and made CCRSB proud! Our students took home five gold and eight silver medals from the provincial public speaking competition. First place winners at the Grade 5/6 and 7/8 levels also received gift certificates and French books. The first place winners from Grade 9/10 received full bursaries to attend a week at Encounters with Canada/Rencontres du Canada in Ottawa during the next school year. Canadian Parents for French, Nova Scotia has partnered with Encounters with Canada for 10 years to provide six bursaries at the Grade 9/10 level. Janice Noble, Hants East Rural High, 11/12 Late French Immersion and recipient of a $1,500 renewable scholarship to the University of Moncton, as well as $200 from Canadian Parents for French, Nova Scotia. Félicitations à tous nos élèves! !